Based on ENL's ethical stance towards future humankind, an economy must respect all of its budgets, without exception. This means that an output cannot contribute to the violation of any of the economy's environmental budgets. This in turn implies that, once an output has exhausted the first budget share it encounters as its production increases, any further increase in output quantity is prohibited. 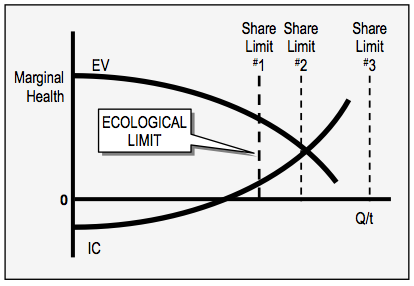 That is, the ecological limit for a final output is the lowest share limit with which it is associated. See the following figure. A final output will typically have many biological flows associated with it, and therefore many share limits. The lowest of these share limits is the output’s ecological limit. "EV" and "IC" indicate effectual value and input cost respectively. The output depicted here requires three biological flows, and therefore has three budget shares. Based on the economic conditions associated with the output's life cycle, these shares are exhausted at the share limits shown. The lowest of these three — share limit #1 — is the output's ecological limit. Unless conditions change, the output's production cannot exceed this quantity. If conditions anywhere in the output's life cycle do change and flow #1 is no longer required, or if this share limit shifts significantly to the right, share limit #2 will become the new ecological limit and thus the new maximum allowable output quantity. This applies to each share limit in turn, until the last biological flow required by the output has been taken into account. Using houses as the final output we can illustrate the method shown above. The houses are constructed of wood and are of standard size and features. Because wood is a renewable resource, the economy will have a budget for wood utilization — that is, for the flow of wood into the economy. Extracting wood from forests causes habitat destruction, which is subject to a second budget. Let's confine ourselves to these two budgets and see how they determine the ecological limit for house production. Like anyone with a budget and responsibilities, we have to think like wise managers. Take the wood budget first. We can spend this entirely on a specific output, such as guitars, chopsticks (the non-plastic kind), dining room furniture, or baseball bats. However, given ENL's goal, we should utilize our budget in such a manner that the health of our society is maximized. Using it all for baseball bats, or even for houses, is probably not the best way to achieve this. ENL's approach to maximization should guide our spending decisions. The simplest approach is to assign each unit of wood to the output that can, under current conditions, achieve the greatest health gains. Thus, if houses currently have a higher health potential than guitars, chopsticks, and furniture, the next unit of wood should be assigned to houses. Assume that the same is true for the next 100 units. At this point, enough houses have been built, and it turns out that the next unit of wood should be assigned to furniture. Then perhaps the wood should go to guitars, and finally to chopsticks. With this approach, each output receives its "fair" share, where fairness is judged by the incremental contribution it makes to society's health. Let's assume that, when this allotment method is applied, house builders are permitted to use 40% of our society's wood budget, and with this wood they are able to construct 25,000 houses. This output quantity is therefore the first share limit for houses. Now let's shift our attention to the second budget — forest habitat destruction. If we assume for simplicity that wood extraction is the only reason our economy destroys forest habitat, then the outputs mentioned above will have no competition for this privilege, and houses will again receive 40% of the budget. However, it may turn out that the habitat destruction budget is considerably "smaller" than the wood budget, in the sense that only 15,000 houses can be built by exhausting the budget share for forest habitat destruction. In this situation we therefore have two share limits for houses — 15,000 units and 25,000 units. Which of these should apply? ENL's goal is sustainable well-being. This means that well-being must be achieved within ecological constraints. Building more than 15,000 houses would cause this output to exceed its budget share for habitat destruction, which could very well cause our economy as a whole to exceed its budget for this flow. This is unsustainable, and the limit of 15,000 houses thus applies. Given the scenario presented here, this quantity must be accepted as the ecological limit for house construction. To summarize: because of the potentially disastrous consequences of overexploiting a biological flow, ENL takes the precautionary stance of choosing the lowest share limit to set the maximum quantity for an output’s production. This share limit is called the output's ecological limit.